There’s no luck in physics. When the sun and the moon and the Earth aligned this week, an Alaska Airlines jet was in the right place at the right time to catch the total solar eclipse. The March 8 rendezvous over the Pacific Ocean was not luck, but a precisely planned equation. The calculations began a year ago. The only variable was the plane. In window seat 32F, Joe Rao was one of the dozen astronomers and veteran “eclipse chasers” among the 181 passengers onboard, gazing out oval windows as the moon blocked the sun for nearly two minutes. He’s an associate astronomer at the American Museum of Natural History’s Hayden Planetarium (where astrophysicist Neil deGrasse Tyson is director). About a year ago, Rao discovered that Alaska Airlines Flight 870 from Anchorage to Honolulu would intersect the “path of totality” – the darkest shadow of the moon as it passes over the Earth. Rao and Kentrianakis are among a tight-knit community of self-described eclipse geeks. These “umbraphiles” (after the umbra, the dark shadow cone of the moon that sweeps across the surface of the Earth) traverse the globe in search of solar eclipses. Total solar eclipse photographed by Alaska Airlines flight attendant Rachael Cadden, who was on the flight as a passenger. “We are all veteran eclipse chasers who have traveled around the world to ‘bask in the shadow of the moon’ for a few precious minutes,” Rao said. In seat 7F was Craig Small, a semi-retired astronomer from the Hayden Planetarium. This was his 31st total eclipse, making him one of the “Big 4” eclipse viewers in the world. He brought along his lucky eclipse flag, which has accompanied him on every viewing expedition since 1973 – and he’s never missed seeing an eclipse. “You can’t be doing something that’s this exciting and not give everybody onboard the chance to at least participate,” said McGlaun, who viewed his 12th total eclipse. In seat 15F, experiencing his 15th total eclipse, was Bob Stephens, a CPA turned amateur astronomer who will film the eclipse with his GoPro, while also taking photos with a couple of handheld cameras. Flying 500 mph at 35,000 feet, Alaska Flight 870 intercepted the eclipse 695 miles north of Honolulu. The moon shadow itself is oval, 68 miles wide by 500 miles long. It swept across the surface of the Earth at 8,000 mph on a narrow path from Southeast Asia across the Pacific Ocean. For those on the plane, beginning at 5:35 p.m., the sun was completely blocked by the black disc of the moon for 1 minute 53 seconds. “In the few minutes leading up to the total phase – much like ‘curtain time’ at a Broadway show – the light in the cabin will begin to slowly diminish as the waning crescent of the sun is gradually extinguished,” Rao said. 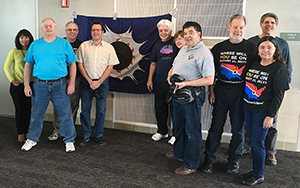 Before Flight 870 departed Anchorage, eclipse chasers gathered with Craig Small’s lucky eclipse flag, which has accompanied him on every viewing expedition since 1973. He’s seen 31. The planning for this moment started immediately after the last total eclipse – March 20, 2015 – when Rao was still celebrating. When Rao examined the path of this March 8, 2016 eclipse, he realized it would be visible only from parts of Indonesia and Micronesian islands – during monsoon season, which increases the chances of a rainout. As he traced the narrow belt as it arced over the Pacific Ocean, he wondered if any commercial flights crossed the path. After some quick online research, he found Alaska Airlines Flight 870. 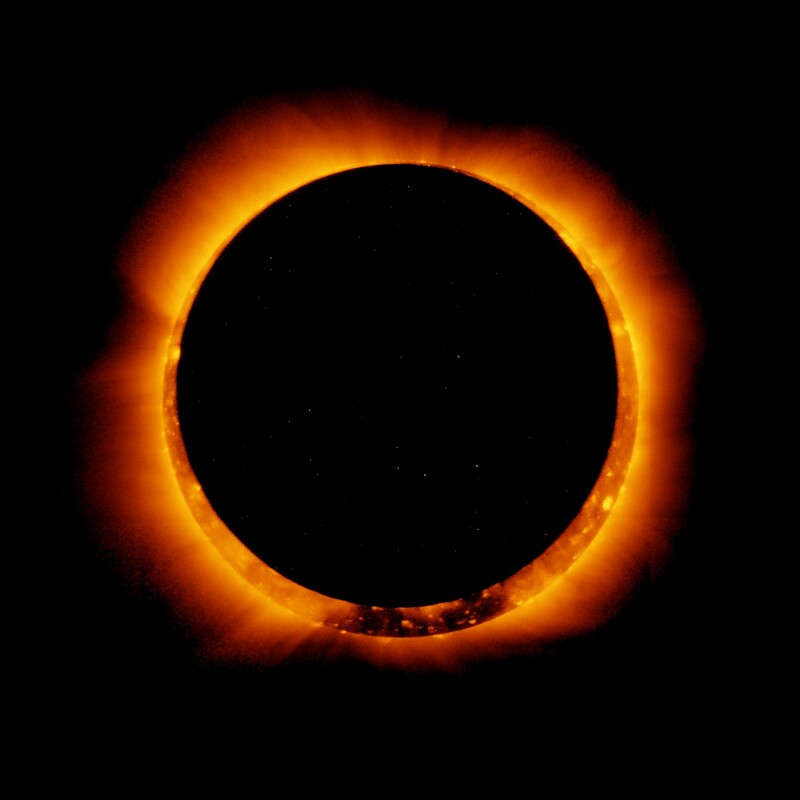 Dr. Glenn Schneider of the University of Arizona’s Steward Observatory (a veteran of 32 eclipses, who will be viewing this one in Indonesia), worked out the suggested flight plans, and Rao presented them to Alaska Airlines to show he was serious. Chase Craig, Alaska’s director of onboard brand experience, found the right people to make it happen. On the day of the flight, Dispatch will develop the specific flight plan, to find the most efficient route and account for weather and wind. Maintenance and maintenance control will help make sure the plane is ready to go – they even washed all the windows on the right side of the plane. Eclipse photograph by Alaska Airlines. For the Alaska Airlines employees who worked to accommodate the flight change, it’s about brightening someone’s day and going the extra mile to create a unique experience. After Alaska confirmed the flight plan would be altered to rendezvous with the eclipse, Rao spread the word to a few astronomical societies. About a dozen people booked seats for the opportunity to see a total solar eclipse from an aircraft. Some of them canceled plans in Indonesia so they could be on the plane. Other passengers who are simply flying from Anchorage to Honolulu were in for a surprise. “We on the Alaska Airlines flight will be the last people in the world to see this eclipse – nobody will see it after us,” Small said. Since they’re flying from the 49th state to the 50th state, Kentrianakis calls this the “almost-Great American Eclipse.” It’s a sneak preview of “The Great American Eclipse” next year – Aug. 21, 2017 – which will be the first total solar eclipse to sweep across the entire United States since 1918. It’s expected to be one of the biggest news stories of 2017. Umbraphiles around the world are already making plans. Track the flight at FlightAware.com. 28 comments on "Chasing the shadow of the moon: To intercept eclipse, Alaska Airlines adjusts flight plan to delight astronomers"
Many years ago, on an AK AIR flight back from Mazatlan, coming in to LAX, there was a partial solar eclipse and the pilot sent back his viewing filter so we could all take a look at it without burning our retinas! Encouraging and supporting our engagement with the incredible phenomena and geography we can only see from the air – solar eclipses to flybys of Denali – seems to be an unstated mission of Alaska Air. You’re the best! Totally agree 100% Alaska Air are helping to cure ignorance, ignorance of our world and beyond. I really hope Alaska see their bookings rise, they are EARNING peoples respect. I almost NEVER leave comments for this stuff but am super impressed with the effort and execution of Alaska Air to make this happen. We can often tell a lot about a company based on the decisions they make that affect a few customers even more than the ones that affect many. I grew up in Seattle but have lived in CA since the 90’s and while I have long appreciated Alaska Airlines’ service (I frequent LA to Mammoth, LA to Monterrey and LA to Seattle) and have had numerous pleasant interactions with staff and crew including a few under duress but they are consistently helpful, thoughtful and professional. They just went up another BIG notch for me while many other competitors are going in the opposite direction. Nicely done! The geometry of the July 11 eclipse worked out such that, by chasing the moon s shadow at Mach 0.8, Schneider and his colleagues could stretch totality to from about 5 minutes to nearly 9 and a half minutes. Why we can’t see earth curvature? How high we need to be to be able too see it? It is visible in those images and quite clearly visible from 11,000 metres / 35,000 feet. Seen it a few times myself. I wonder in the spirit of Alaska Airline’s “going extra mile” for the customers if the plane also did a 360deg horizontal turn (complete circle around itself) to accommodate people on the other side (seats like 1A, 15A ..) so that they also get to see it from their own side ? 😉 .. Just kidding ! Very well done to Alaska, so many people are so ignorant of the world and solar system they live in and this incredible act by Alaska, help cure this ignorance. Very, very well done Alaska in helping to cure ignorance and to share in one of nature’s grand shows. Year ago — at least twenty! — I was flying from Vancouver (BC) to Portland on Alaska, and the pilot lowered his altitude and reduced his speed a bit to give us a nice view of (if I remember correctly) Mount Ranier. It probably wasn’t quite as spectacular as watching an eclipse over the Pacific; nevertheless, the thoughtfulness and accommodation of the Alaska crew has stuck with me through the years, and I still tell that story occasionally. Alaska Airlines and staffs and Mike Kentrianakis, all of you had made this first total eclipse Video at 37000 ft possible and had made known to me of your Great Alaska Airline half way across the world, ‘The great Alaska Airline’. Just Great! I remember Joe Rao from an astronomy cruise from NYC to Bermuda in 1980. We encountered 30-foot waves on the way back to NYC, and most everyone was seasick, but Joe still gave his lecture, lying on his back on the stage because if he sat or stood he got seasick too. Then in 1991 my parents were on an eclipse cruise in Hawaii, and while it was overcast nearly everywhere in the line of totality, Joe somehow found a cloud-free area and directed the ship’s captain there, so they all got to see the eclipse when most people on the islands missed it. Glad to hear that he is still enjoying eclipses and having fun! A great thing to do for your customers, more airlines should do it when they can, adjust times or flight routes to intercept such wonderful natural occurrences! Thanks, the YouTube video was great, I just wish I was on the flight. But, thankfully I live in North Carolina, so I can easily see the total eclipse August 21, 2017, after driving a few hundred miles. I am totally in awe of Alaska right now. It would be somewhat ridiculous, but I would love to see some more Alaska in Chicago. I so rarely get the opportunity to fly them, but love it when I do. Great people and a great culture make this airline great. Well done Alaska Air. I live in sunny Australia, you guys may have to take off the thermal suit if you visit here. 🙂 If the opportunity comes, and hopefully it wont be to far away, if our lines intersect, I will definitely grab a ticket in appreciation of your of your effort to make this a special occasion. I bet the crew loved it too. Hat’s off. Congratulations to everybody who made this possible. Greetings from Rotterdam, Holland. Love this story! I’m delighted but not surprised — because Alaska is simply the best airline. They get it. The adjustment to accommodate these customers does not surprise me. The other day I left my phone at the terminal and when I realized it was missing I was already in my seat . I was not aloud to deplane and when I expressed my concern to the flight attendant she promptly made a call to the captain . He got out of his seat walked down the steps outside in the cold. Went inside and retrieved my phone from where I had told them I thought it was at. Your readers are invited to visit NationalEclipse.com for more information on the 2017 eclipse. One of a kind company that is customer focused ! I remember when Alaska was the first airline to offer online ticket sales. Alaska Air is the greatest……Many years ago returning from Cabo my flight had already closed out, engines running, I stepped out of the terminal and realized I missed the flight. The pilot saw me looking rather disappointed. He opened the little window along side his seat, stuck his arm out and motioned me to come on out. He lowered the boarding stairs, shut down the left engine and we climed on board..
How kind. Alaska Air is the best. I would not fly anything else if I can. Always the best service since I have flown them. Cheers! Oh wow! I wish to take this flight & see it with your real eyes. You should find out the next natural incident like this &I make it like a tourism. I’m sure you will make a lot of money or so well public relations for your company more than you ever know. Thanks for sharing the VDO and writing in details. It’s indeed super interesting! I love Alaska Airlines!!! I’ve always experienced great customer service and care. This latest example of delaying the flight for 20 minutes to allow attendants a once-in-a-life-time (and historic) opportunity to view the eclipse exemplifies the airline’s commitment to “real and earnest” customer care. I am proud to be a loyal fan of this company. What a wonderful example of going beyond the ordinary to serve!